Last year I discussed several upgrades that the Destin Pelican Beach Resort either has completed or working to complete. While I was at the resort in December, I had the opportunity to look at some other units and some of the upgrades those owners were doing. One thing that really impressed me was counter upgrades. 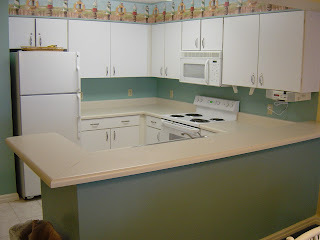 Besides corian and granite upgrades there was also another way to upgrade the counter tops. Instead of removing the counter tops, a special process is done that includes sanding down the miter joints and installing several coats of a special polymer. My friend Maris who owns unit #314(2 bedroom unit) sent me before and after shots of his counter tops.In my opinion these are very nice and not terrible cost prohibitive. 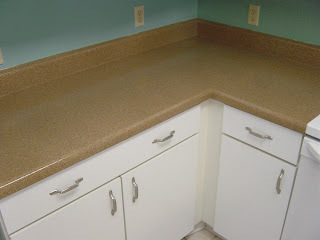 I plan to upgrade my counter tops when they start showing deterioration like this before shot.